As announced late last year, the premium Nokia brand has opened it's doors in Tokyo. The Vertu Japan flagship store, naturally located in Ginza, is a three story affair with main floor devoted to display of the three models available - Signature, Ascent and Ferrari - while the second floor offers a private lounge and level three caters to customer service. As the news is not yet listed on the companies main site, see the photos with more details in Japanese Here. 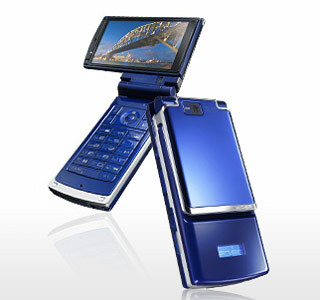 Apparently the actual handsets will be available on the dori sometime in Q2 2009. DoCoMo and Fujitsu announced that they have localized a mobile phone, based on the F905i model sold in Japan, targeting sales into the Taiwanese market. The new handset was officially launched by Far EasTone Telecomm, in which DoCoMo has an equity stake and is the exclusive provider of i-mode in Taiwan, this week. The F905i offers advanced features such as 3.2-inch full-wide VGA two-position display, 3.2-megapixel camera and Fujitsu's proprietary technologies for exceptionally clear sound and voice reproduction at 30% slower speed for easy comprehension. The Communications and Information Network Association of Japan - CIAJ - has released a report on mid-term demand for telecom equipment with a gloomy, though predictable, forcast. While exports have been holding YoY results, domestic sales are expected to slip about 14 percent in fiscal 2008. According to their research, confirming widely held industry views, the rapid drop in demand for handsets resulting from the newly implemented sales plan, which raised handset prices has produced this so-called negative growth effect. According to this article on the Mainichi Shimbun, National Police Agency figures released for 2008 show that over 63 percent of calls for emergency services in Japan come from mobile phones. Results showed that a total of 5,165,795 calls were made from mobile phones, up 1.5 percent from the same period the previous year and the biggest year-on-year increase for the period. In order to trace the source of mobile phone calls, which are harder to track than land line calls, police in 21 prefectures, including the Metropolitan Police Department, have introduced location data reporting systems, with police in 10 other prefectures, including Aomori, planning to buy similar systems by the end of June this year. According to local media reports DoCoMo will market a dedicated e-photo frame, with it's own email address, by spring this year. Apparently the LCD screen of the prototype developed in-house, sorry we could not find an image, is slightly larger than a postcard. The unit can store up to 1,000 photos, has a slide-show function while voice messages and video images also can be sent to the frame from a mobile phone. The estimated retail price is 20,000jpy or about $220usd.